Every girl needs a pair of pearl earrings that are modern, lightweight, and elegant. 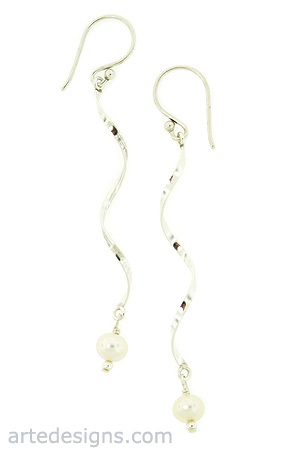 Natural white pearls dangle under a swirly sterling silver design. No two are alike. Pearl is an emblem of purity. It symbolizes love and happiness. Just over 2.5 inches total length. Sterling silver ear wires.